Like any great winemaker, Chef Ben Overland believes a great chef must have a connection to the ingredients they are using; understanding the seasons, the terroir, time and care that makes his dishes exceptional. He sees his role as Chef at the Great Estates Okanagan as an opportunity to bring his passion for wine and food together, creating fresh and flavourful food pairings that complement an outstanding range of wines. 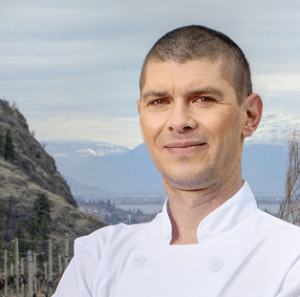 Originally from Calgary, Chef Overland worked his way up to Executive Chef at The Belvedere before relocating to the Okanagan in 2013, working at a number of revered winery restaurants before joining the Great Estates Okanagan team this year. Now overlooking the stunning views of the Okanagan Valley at See Ya Later Ranch’s seasonal patio restaurant, Chef Overland brings classic technique with a modern flair to his seasonal menu, which can also be sampled at Sumac Ridge Estate Winery, home to Black Sage Vineyard and Steller’s Jay sparkling wines, for special events and private group wine and food pairing dinners.